There are two types of orange trees grown most commonly in California--Washington Navel and Valencia. Valencia used to be the leading orange in Florida, but is now the most important cultivar in Texas, California and South Africa. It fruits once a year, which makes it a long-lasting harvest. The Washington Navel reached California in 1873. The fruit isn't as juicy as other oranges, but has an excellent taste. Oranges grown in humid conditions, such as south Texas, are yellow-orange in color and have thin skins whereas those grown in the cooler climate of California are bright orange with thick skin. Grow orange trees in the sunniest part of your yard. In California, the brightest spot faces the southern direction. Orange trees need at least six to eight hours of sun every day. Grab a handful of soil from the planting spot. Hold it tight and squeeze to see if there is moisture present. Amend wet soil if you notice drops of water come out when you squeeze it. Many urban areas in California have clay soil because it is used as fill when building subdivisions. Add 6 inches of compost and builder's sand to make the soil more conducive to growing California orange trees. Till the substances together to thoroughly combine. Add organic content to sandy soil, found in Southern California, especially in the mountain and coastal areas. This type of soil is made up of 80 to 100 percent sand. It drains too quickly, so add some organic material like manure and compost to the sand to make it more fertile. Leave loamy soil alone. It's common in Southern California, especially in plains and valleys. It drains well enough for orange trees. Loam is comprised of sand, clay and silt. Test the soil pH. Orange trees prefer a pH range of 5.5 to 6.5. Soil pH kits are available from nurseries and soil testing companies. Make a 6-inch deep hole and gather a sample. According to the University of California, cooperative extension offices can offer you a list of soil testing companies. The companies will provide instructions on collecting the samples. Amend the soil if the pH is too alkaline or acidic. To increase the pH by 1.0 point and make it more alkaline, mix in hydrated lime. Use 4 oz. per square yard if your soil is sandy. Add 8 oz. for loam, 12 oz. per square yard in clay and 25 oz. of hydrated lime in peat. To reduce the soil pH by 1.0 point, mix in 1.2 oz of ground rock sulfur per square yard if the soil is sandy, or 3.6 oz per square yard for all other soils. Mix the sulfur thoroughly into the soil before planting. Sawdust, composted leaves, wood chips, cottonseed meal, leaf mold and especially peat moss, will lower the soil pH. Dig a hole twice as wide and the same depth as the orange tree's root mass. It should be planted as deep as it was in the nursery container. Remove the orange tree from the container. Rinse the root mass to get rid of some of the soil. Spread the roots out gently by hand. Set the tree in the hole and backfill with the removed soil. Tamp it down to remove air pockets. Build a berm, which is like a water basin, around the orange tree. Make the circular mound 2 feet wide and 4 inches tall. Water the tree deeply. Water the orange tree once a day for 10 weeks. After that, cut down on watering to once a week. Water California orange trees once every 10 days if your region does not get much rain. Let the water soak in so it reaches the roots. Long, deep waterings are better than short, shallow ones. 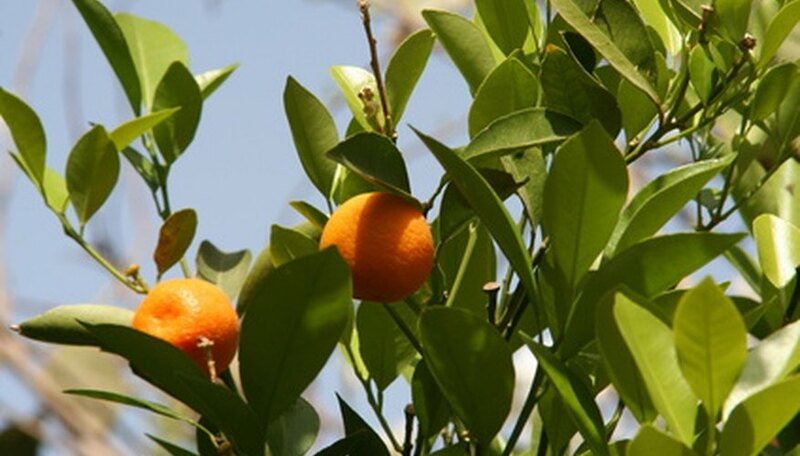 Feed orange trees with a slow-release blend containing a nitrogen-phosphorus-potassium ratio of 21-0-0. Apply it three times in the first year around the bottom of the tree. Water to help the fertilizer soak in. Prune orange trees once every two years. This will keep them healthy, improve their form and allow for better sunlight and air circulation. Prune before flowering begins early in the year. Remove dead branches, branches that criss-cross and those that are rubbing against each other. Cut off the small shoots growing from the trunk as well, because these steal nutrients from the rest of the tree. Make the cuts where the unwanted wood touches another limb or the center trunk. Protect your tree in the winter if the temperature dip to freezing. Drape a light winter sheet over the branches to keep the freeze out. In extreme temperature drops, you can put a few light bulbs under the cover. Be careful, though, because this is a fire hazard. Keep the light bulbs away from the tree and the sheet. Read instructions when using fertilizers and other chemicals. Wear gloves as protection when pruning orange trees. Use hand shears to cut smaller branches and dead branches. Long handled loppers should be used for thicker wood and a pruning saw is handy for the thickest branches. Don't expect to adjust the pH drastically in one season. Use several seasons to accomplish your goal.